Muammar Gaddafi’s army won control of a strategic rebel-held Libyan town and laid siege to another as the revolutionary administration in Benghazi again appealed for foreign military help to prevent what it said would be the deaths of hundreds of thousands of people if the insurgents were to lose. The rebels admitted retreating from the oil town of Ras Lanuf – captured a week ago – after two days of intense fighting and that the nearby town of Brega was now threatened. The revolutionary army, in large part made up of inexperienced young volunteers, has been forced back by a sustained artillery, tank and air bombardment about 20 miles along the road to the rebel capital of Benghazi. The head of Libya’s revolutionary council, Mustafa Abdel Jalil, claimed that if Gaddafi’s forces were to reach the country’s second-largest city it would result in “the death of half a million” people. The Arab League, meeting in Cairo, called on the UN security council to impose a no fly-zone on Libya as Gaddafi’s forces also began to move against Misrata, a city of 300,000 people about 125 miles from Tripoli. Misrata is the only town in the west of the country still under the control of the insurgents after their defeat in a vicious battle for Zawiya. 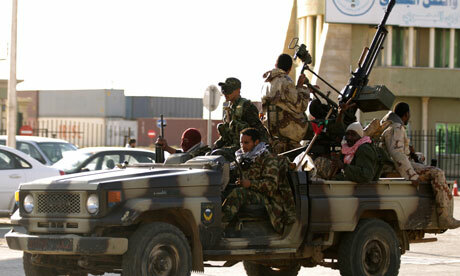 The rebels said that Misrata was now surrounded by Gaddafi’s forces, which included tanks. The rebel Libyan leadership is frustrated that the European Union failed to agree to a no-fly zone at a meeting on Friday and US President Barack Obama has so far proved reluctant to apply anything more than sanctions and diplomatic pressure on Gaddafi. “Of course we’re disappointed, because every day that passes civilian people are either killed or injured and Gaddafi is bombing them with all kinds of weaponry,” Jalil said. But he also claimed that the rebel army was able to call on far larger numbers of volunteers than those already fighting. He also ruled out negotiations with Gaddafi. The revolutionary council has appealed for European countries to launch air strikes to reverse Gaddafi’s military gains. It also called for an international investigation of what it says are two vessels from an “eastern Arab country [believed to be Syria] with Soviet-era weapons” bound for Tripoli. The Arab League’s call for a no-fly zone gives the regional seal of approval Nato has said is needed before any military action. Egyptian state television also said that the Arab League had decided to open channels of communication with the Libyan rebel council based in Benghazi. The league said the council represented the Libyan people, the channel reported. League officials said they had already been in touch with the rebels about the situation on the ground in Libya. Arab states must intervene in Libya or risk unwanted foreign intervention, Oman’s foreign minister told the meeting. “What is needed now is Arab intervention using mechanisms of the Arab League and at the same time in accordance with international law,” Omani foreign minister Youssef bin Alawi bin Abdullah said in his opening remarks to an Arab League meeting. “We must look at various options that circumstances in Libya need,” he said, giving brief opening remarks during a televised opening session over which he presided. “What is happening now to the Libyan people poses a threat to the security and stability of Arab states. “If the Arab League does not take responsibility to prevent a downward spiral, that could lead to internal fighting or unwanted foreign intervention,” he added.